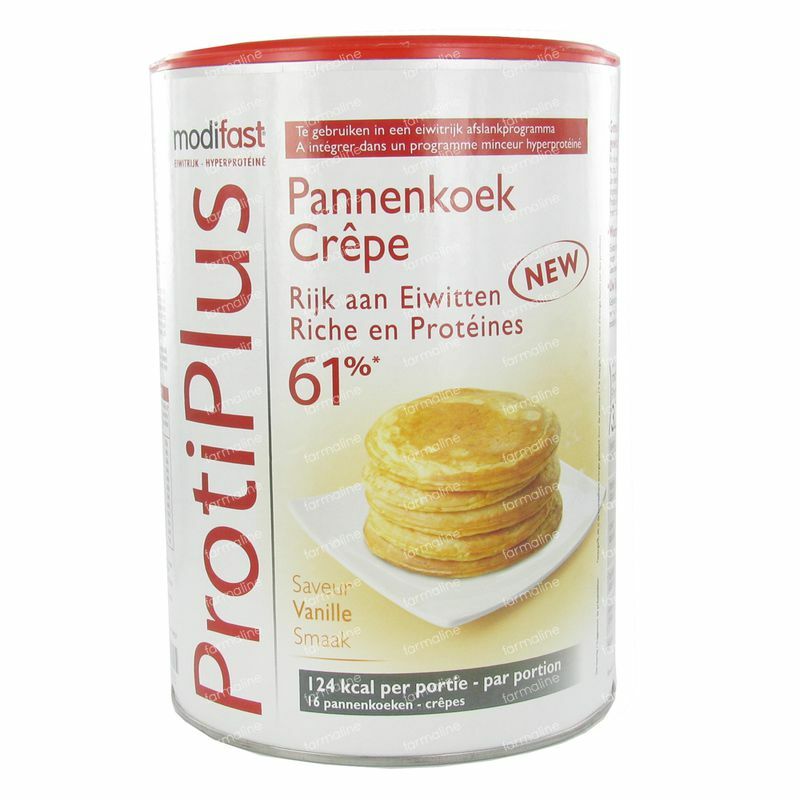 Modifast Protiplus Pancakes Vanilla 540 g order online. Modifast ProtiPlus Pancakes has an ultimate effective slimming method. Through alternating 3 days strict diet with less strict days is it a way to be good full and to prevent a YoYo effect. Moreover the products contains many proteins where by the hunger feeling is reduced. Apply around 100ml of water in a shaker or bowl en add 3 leveled off spoons (33g) of Modifast Protiplus, mix the powder powerfull untill it's completely solved. Cast the preparation in a hot frying pan with Anti-stick coating. Bake the pancake for 3 minutes on one side, then flip it over and bake the other side for 1 minute. Bon appetit. Milkprotein, chicken-egg-protein, egg, glucosestroop, Fibre: inuline, minerals (magnesiumcarbonaat, calciumcarbonaat, natriumchloride, iron diphosphate, zink sulphate), Thickening agent: xanthaangom, Ricemiddle: natriumwaterstofcarbonaat, Acid regulator: trikaliumcitraat, aroma, skinny milk. Antiklontermiddel: siliciumdioxide, zoetstoffen (aspartaam, acesulfaam-K), foodacid: citroenacid, vitamins: C, E, A, D, B6, B1, B2, foliumacid. Kleurstof: beta-caroteen. Contains a source of fenylalanine. Can contain traces of lupine and gelatine.